McCall Staffing Services has over 41 years of service success as a premiere employment resource for administrative, information technology, support staff and customer service positions...and more. The knowledgeable McCall staffing team serves candidates, employers and our assignment employees with integrity, professionalism and personalized attention. Local Bay Area ownership assures consistently responsive service, flexibility and accountability. A description of our services and specialties. We are devoted to introducing mission-driven candidates to the Bay Area’s arts, philanthropic, and educational nonprofit community. A summary of the basis for McCall success. Our assurance to you of our commitment to the spirit and letter of the law. 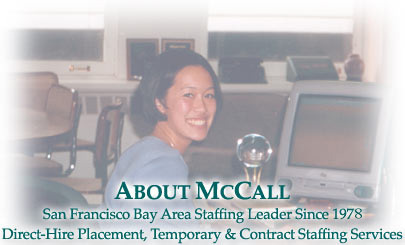 Reading feedback from people familiar with our services completes the introduction to McCall Staffing Services. Leave a review of your own of our services!